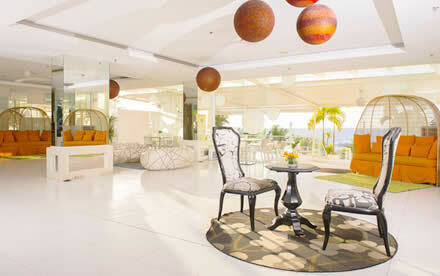 Beach lovers of every age are sure to have fun on a holiday spent at our day use resort in Mactan. Our spacious beach near Cebu City has more than enough room for fun family activities. Our resort also offers various gaming facilities. Simply take your pick and don’t hold back on having fun. Expect sumptuous meals and comfort dishes at SALT restaurant. Our excellent in-house dining outfit serves complimentary breakfast meals from 6 to 10 AM, and delicious choices from 11 AM to 10 PM. End your day with scenic sunset views and potent concoctions from the Beach Bar. Read more…. Our 641-sqm beachfront is a picture-perfect location for your wedding, reunion, or company outing. It has enough room for about 400 guests. We also have 2 decks and poolsides for smaller outdoor activities. In addition, our boutique resort also has a 300-seater grand ballroom, as well as several function rooms and a boardroom for indoor events. Read more…. Delight in a seaside adventure at our wide beachfront and outdoor pools. Our resort features a free form pool, children’s wading pool, and jacuzzi. We also have a dive shop and gift shop. Find fun activities without changing into your swimsuit at the resort’s multilevel decks and gaming room with facilities for billiard and table tennis. Read more…. We’ve got all practical concerns covered! Our resort has lockers for day guests, and a business center for corporate travelers. We also offer laundry service, limousine and transportation assistance, foreign currency exchange, and the use of safety deposit boxes. For your safety, the resort has a clinic and an in-house nurse. Read more…. Book a stay at our day use resort in Cebu today and look forward to a convenient and affordable getaway with the people that matter most to you.